I know this is a little... you know, late to the game and all... but I have a full time job now, and getting up at 7.45 each morning is a challenge I haven't faced in quite a while. Except for this time last year when I was at CSIRO and I started work at 7.37, but that was different because it was on a farm and I was wearing a lab coat. Or something. I almost thought I'd stumped myself with the under-50-dollars, but them somehow, it came together quite magnificently in the end. I'd like to make an addendum to the list though, and then we'll talk bundt pan. The first item on my 50 dollar list was a beautiful buttery-soft leather case. The case in itself was $49 AUD, so I thought I'd give you another option, which is a bit more value-added. It's from Kikki-K though. Always is. Lovely things made from leather are, as I've mentioned previously, oft under-rated. 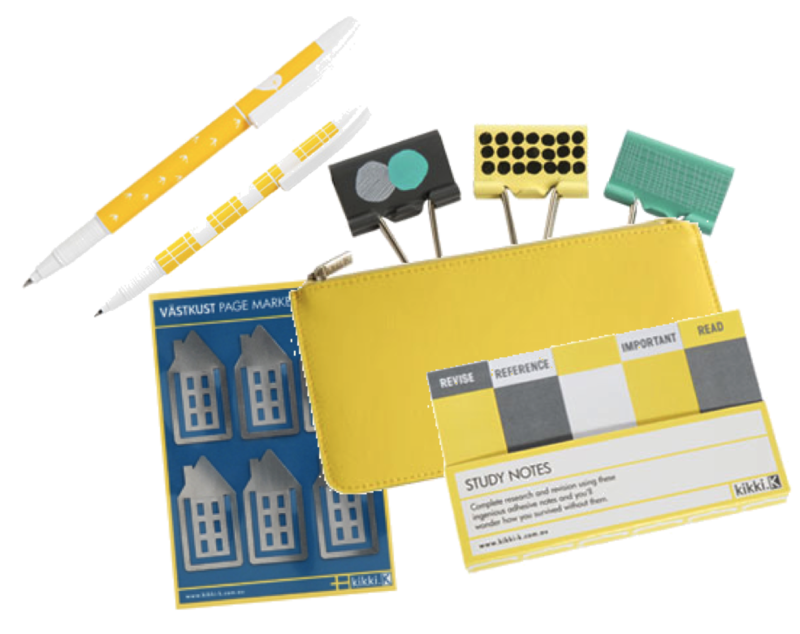 So, to start, obtain a leather pouch, $19.95 AUD, from Kikki-K. Obtain it in yellow, because it's just better. Then place in it two gel pens, $4.95 AUD each. Make one of them Vastkust yellow, and the other Bird yellow. The key to these kinds of presents is to stick to a theme. This theme is yellow. After you have placed the pens in the case, you must also place in it some sticky notes (yellow), $5.95 AUD, and finally add some Jord bulldog clips, $2.48 AUD, and some Vastkust metal page markers, $6.95 AUD. You won't regret any of it. The beauty of this idea as a whole, is that it can also be replicated with red or black if you are so inclined. Go red for your valentine, and pick the heart-shaped sticky notes and the love-heart rubber bands. And maybe the zoo ones for good measure, because rubber bands shaped like animals fill me with glee. Fill the black pouch with whatever you want, I don't care for it. I feel there is a lot of leeway in this under 100 dollars jive. You can either get one big lovely thing, or a selection of little lovely things. Not that you couldn't do that under 50 dollars, but there's more room for food for thought to breathe when we're dealing with 100 dollars. Or something like that. So first up, a 12 month subscription to ABC Delicious magazine, $65.00 AUD, paired with a bundt pan, $10.00 AUD and some other little things. Read on. Magazine subscriptions are a bit blah by themselves, so by adding other little things, they become less blah, more ooh ahh. You like what I did with the rhyme there? 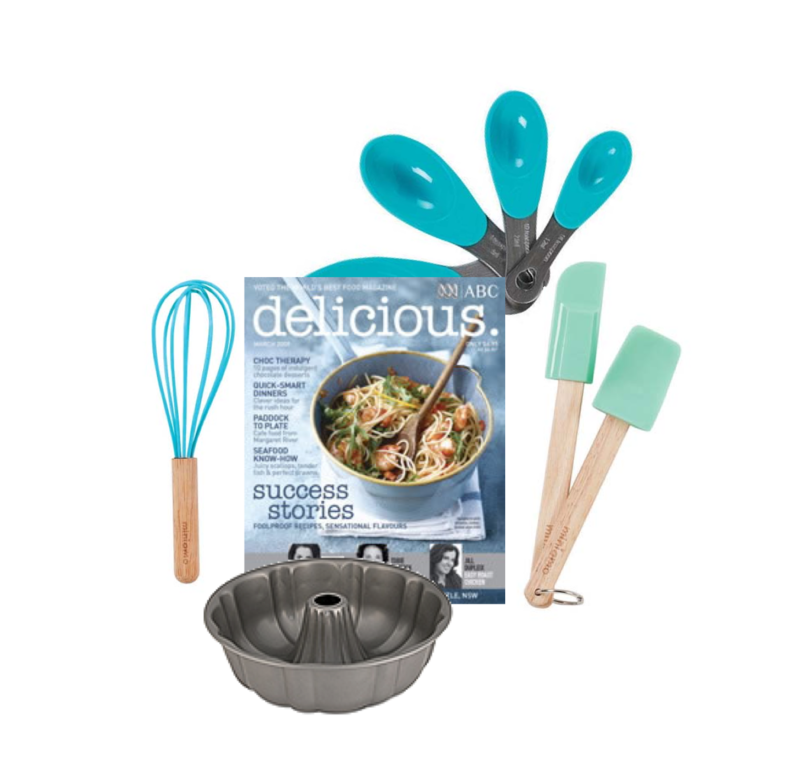 I've done my share of foodie magazine reading, and I think Delicious is one of the best. Unlike, say, Gourmet Traveller, which is full of recipes requiring turducken-like amounts of effort and/or a Filipino maid, the recipes in Delicious are approachable and generally don't require overly-gourmet ingredients or the knowledgeable-assistance of a Filipino maid. As for the bundt pan, well..such pans are just hilarious in general. So, you have the magazines, you have the bundt pan; let us add some other little things. I say first a whisk. A blue silicone whisk, $3.95 AUD. And then some spatulas. Some blue silicone spatulas, $5.95 AUD. And probably also some measuring spoons. Blue silicone spoons, $9.95. And then you're pretty much done with that one. We'll go for a big nice lovely thing. 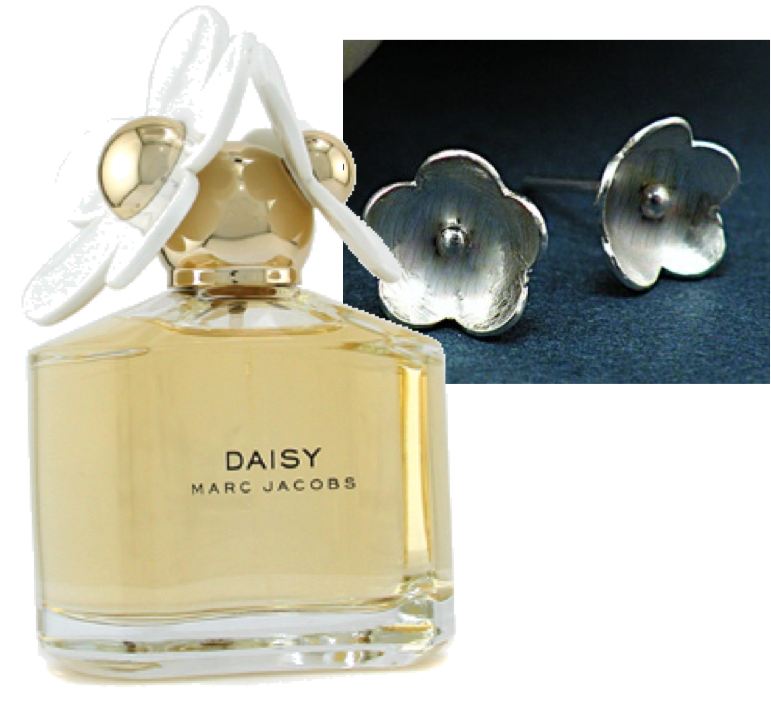 Marc Jacobs Daisy, just do it. In fact, do the 50ml EDT, $63.50 (again from Strawberrynet). If you want to go all out, the 50ml EDP is $100.50. In this case however, purchasing the EDT will allow the addition of a little something something to the mix... Something like these tiny little silver flower earrings from Etsy seller bellabijoujewellery, $24.00 USD. Remember it's all about picking a theme. With shipping from Canada and the USD conversion, these might put us slightly over the whole 100 dollar jive, but what's a few bucks between friends eh? Sometimes life calls for an afternoon spent in a beanbag. A giant bean bag in a shady nook. A giant beanbag for $49.95. An afternoon spent in a giant beanbag with some food for thought, like a year's worth of Australian Geographic, $49.95. Or, if that sounds a bit too academic, an afternoon spent in a beanbag with some serious drink is probably an even friendlier option (I think so, anyway). 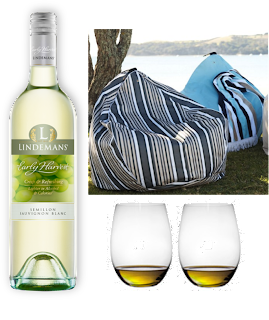 Lindeman's Early Harvest semillon sauvignon blanc, $12.99/bottle is 25% lighter in alcohol, which surely means on a hot summer afternoon you can drink 25% more of it, especially if you soak up some of the alcohol. Of course, you'll need to provide some kind of drinking implement, and the Riedel O series is a very good option, no stem to balance precariously on the grass means no unfortunate spillages in the shady nook. 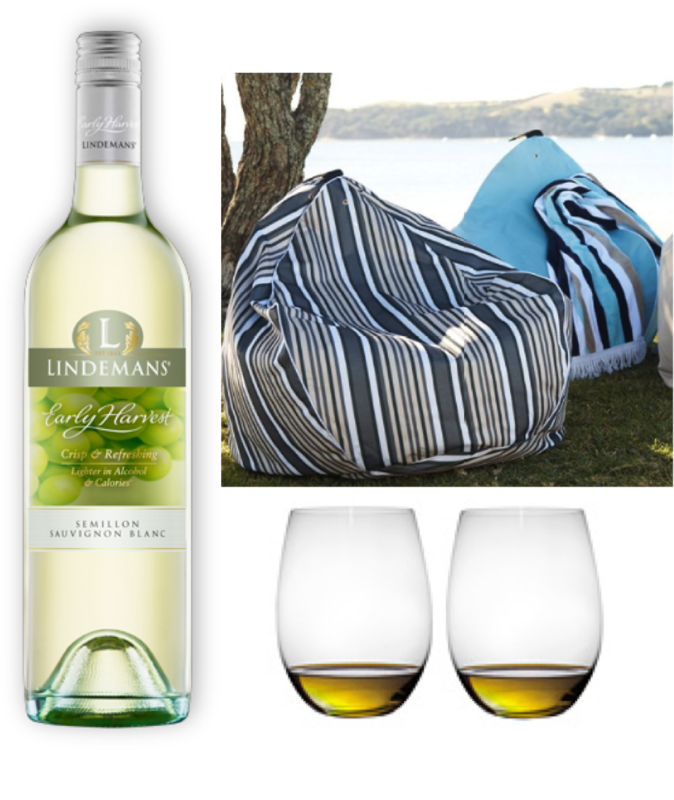 Pick a pair of riesling/sauvignon blanc for $38.00 AUD and all that yummy wine will be safe.